An intruder alarm is installed with two clear objectives, firstly, to deter crime and secondly, to provide a notification that a premises has been illegally entered. Occasionally there is a third aspect, to provide a panic button to create an alert when a person(s) are directly threatened. However, not all systems are equal. A professionally installed Pyrotec system is designed and installed to the latest British, European and Police standards and provides peace of mind that your property is properly protected in your absence. To determine your requirements, an experienced Pyrotec surveyor will visit your premises and advice on the best solutions and equipment available. The starting points for any professionally installed alarm system is assessment of the risk of break-in and providing the appropriate system Grade. This is usually determined in one of two ways; Insurance company requirement or location survey. In either case Pyrotec provide a free survey which will determine the technical aspects of the installation. Intruders are expected to have little knowledge of the alarm system and may be restricted to a limited range of easily available tools. Please note, Pyrotec do not install these systems. Most domestic installations will require a Grade 2 with larger homes possibly falling into Grade 3. Most commercial premises will require a Grade 2 or 3 system. The majority of insurance companies require a Grade 3 system where the system is a requirement of insurance cover. Wired alarms comprise a number of electronic sensors that are connected to a control panel by low-voltage wiring and are governed by a certain series of British Standards. Ideally these are installed into new premises during the building works or during refurbishment as it is more convenient to run the wiring at these times. Alternatively, wireless alarms as the word suggests, use battery powered sensors that are ‘connected’ to a control panel by narrowband RF signals (radio signals). These systems are still governed by British Standards but may be limited in the final system Grade (usually Grade 2). The benefits are they are quick to install and cause minimal disruption to existing decor. The minor downside is that the sensor batteries have to be changed from time to time. When a bells-only (or audible alarm) system is triggered, it makes a loud noise, which will hopefully alert someone in the area to the situation and/or scare off an intruder. However, unlike a monitored alarm or one with a speech dialler, it won’t automatically contact a named person or the police. Monitored systems, unlike Bells-only are designed to alert someone in the event of an activation and have three main categories: a speech dialler, a keyholder contract or a police contract. A non-contract option is a speech dialler, this is a device built into or connected to a wired or wireless alarm. The idea is that when the alarm goes off, the speech dialler will call a set of pre-programmed phone numbers of your choice, for example family members or your mobile, until it gets an answer or can leave an automated message. There are two types of contract monitoring: Keyholder and Police Response. With both types there is an annual cost to have your alarm system monitored, the benefit is that a nominated keyholder or the police will be alerted when the alarm goes off. Keyholder monitoring is done through a company (ARC alarm receiving centre), which will contact your nominated keyholders. The added benefit is that the communication path i.e. phone line or GRPS, is automatically checked to ensure it is still working. Police monitoring, in addition to the receiving centre contacting your Keyholder, they also contact the local police force via direct access to their dispatch control. 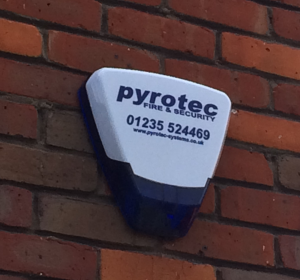 There is a comprehensive range of British and European Standards that govern the installation of intruder alarms, especially those requiring police response, Pyrotec are a NSI GOLD accredited installer and are audited to ensure compliance to these standards.